The European Space Agency’s (ESA) Earth Explorer Aeolus satellite has been launched into polar orbit on a Vega rocket. Using revolutionary laser technology, Aeolus will measure winds around the globe and play a key role in our quest to better understand the workings of our atmosphere. Importantly, this novel mission will also improve weather forecasting. Carrying the 1,360kg Aeolus satellite, the Vega rocket lifted off from Europe’s Spaceport in Kourou, French Guiana, at 21:20 GMT on 22 August. Named after Aeolus, who in Greek mythology was ‘keeper of the winds’, this mission is the fifth in the family of ESA’s Earth Explorers. 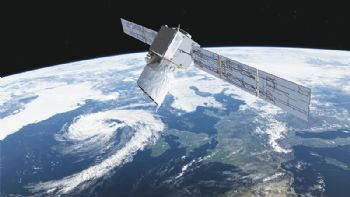 ESA’s (www.esa.int) director of Earth observation programmes, Josef Aschbacher, said: “Aeolus carries the first instrument of its kind and uses a completely new approach to measuring the wind from space. This mission will provide an insight into how the wind influences the exchange of heat and moisture between the Earth’s surface and the atmosphere — important aspects for understanding climate change. Aeolus carries one of the most advanced instruments ever to be put into orbit. The first of its kind, the Aladin instrument generates pulses of ultra-violet light that are beamed down into the atmosphere to profile the world’s winds — a completely new approach to measuring the wind from space. The satellite is being controlled from ESA’s European Space Operations Centre in Darmstadt, Germany. Controllers will spend the next few months carefully checking and calibrating the mission as part of its commissioning phase.